-	List available servers. Here you can view a list of the servers, probe and delete them. The options are very straight, there's not much to take on account apart from taking care of choosing the right entry. You can delete or probe multiple servers at the same time, although you will be prompted for confirmation in case of the latter. -	Add a new SMTP server. 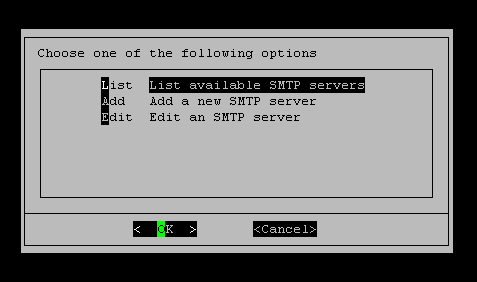 A form that will allow you to add the common SMTP server configuration options. They are the same explained in the Man Page. -	Check SMTP servers. This option allows you to choose one or more SMTP servers to check. They will be iterated and a text message will be sent to the e-mail address you coose to input. -	Delete servers. This button will delete selected SMTP servers in the selection list. XSIBackup SMTP client requires PIPELINING extension to be activated in the server. Most SMTP servers do use this extension nowadays, so it should not be a problem. Always check your SMTP servers before using them in production. Should you find some trouble configuring your SMTP servers, just use a Gmail, Yahoo, Hotmail account. We have tested all this with XSIBackup. Note: in case you use a Gmail account, you have to enable the "Less Secure Apps" for your e-mail account to operate with ESXi/XSIBackup.